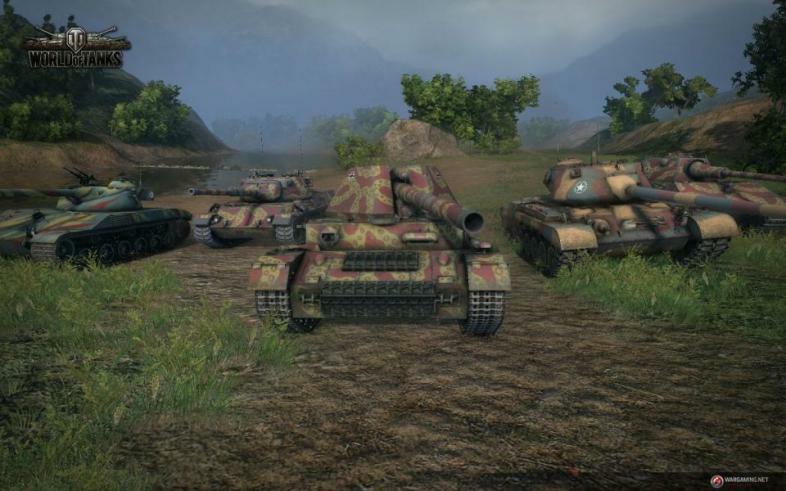 World of Tanks plays like a mix of a 3rd person shooter and a moba. The game interface starts in the garage where you can select, buy, upgrade and customize your tanks for battle. There are 10 tiers of tanks which require experience to research and several lines of tanks across 6 countries to play with. There are American, British, French, German, Russian, Chinese and Japanese each with their own classes to choose from. Tanks start off with stock equipment and can be upgraded with better parts which lead to the next tier of tank. With the lower tier tanks the required experience is relatively low with the scale required for the top tier tanks being a very arduous task to reach. Customization of your tanks not only includes the upgrades, but camouflage and markings on your tank to diversify your tank. Your tank also has a crew to manage and level which will increase the efficiency of your tank. Once you’re all set in the garage it’s time to take to the field and go head to head with other players. Matches are set to 15 minutes and rarely go for the full duration. Driving uses the wasd keys to move around with the mouse to rotate the turret and fire, making it easy for anyone to pick up and play. The finesse in the gameplay revolves around positioning, map control and camouflage of your tanks. Sometimes sitting at the bottom of a hill can give you a better advantage over a tank than trying to take it. Hiding in the bushes and firing from a distance can win over charging in and brawling with an enemy tank. There is a great deal of strategy involved coordinating with teammates to bring out a victory. Watch out for this tank destroyer. The tanks in the game are broken down into 5 classes – light, medium, heavy, tank destroyer and self-propelled gun. Each team has a random number of these 5 in battle and each contributes differently to the battle. Light tanks work as scouts and harassers on the battlefield. Usually equipped with auto-loading guns they fire off rounds very quickly, doing small amounts of damage to enemies to paint them for the bigger tanks to focus on. They are the first tanks you get in the lower tiers before branching off into the others, but don’t let that fool you into thinking light tanks are easy. By far they are the most difficult to learn and master. Next and most people’s favorite are the medium tanks. Medium tanks are the jack of all trades class – they have good speed, firepower and armor. They aren’t exceptional in any area but their versatility is what makes them dangerous. The heavy tanks are the beasts which rule the higher tiers. Unlockable after tier 5 they carry heavy armor and health to soak and bounce damage. They hit hard with big guns but their slower speed exposes them to being flanked by light and medium tanks, so they’re not invincible by any means. Tank destroyers bring the biggest and loudest guns to the fight, capable of tearing apart tanks of higher tiers easily. They stick to the back of the fight with very weak armor they cannot brawl with any other tank class. Finally the self-propelled guns are the snipers of the game. They operate completely different from the other 4 classes as their aiming reticles use a top down view of the map, their reload time is substantially higher than the other classes, and they are incredible slow and fragile. It is the second hardest class to learn how to play as it requires a great deal of patience to line up shots and make them. Depending on your personal preference you will find a spot in one or a few of these classes to play with. Winter in a ruined city is still beautiful. The graphics of World of Tanks are to the standard of its release in 2010, and holds up quite well even into 2015. The tank models have incredible detail taken to them modelling all the little gadgets and equipment on them. The buildings and rubble are well detailed in each map; the nature lacks a little in its presentation compared to other games. As of this year there have been updates coming to put the game into a higher quality of HD. Only a few tanks have been converted to HD with more coming this year, but the improved graphics have detailed out the accessories, barrels and tracks of the tanks. The sounds of World of Tanks capture the feeling of battling tanks from the World War II and Cold War eras. The engines sound and feel authentic to the tanks which they portray, lights and mediums having a muscle car tone to them; where-as the heavies, tank destroyers and self-propelled guns lumber like a construction vehicle. The cannon fire depending on what caliber your tank is using may sound like firing a gun; other times your cannon will sound like it can be heard all the way across the map with how heavy it feels. These tanks come with a small price tag. World of Tanks is a free to play game that has a multitude of micro transactions ranging from premium time, premium tanks and currency for the game. The premium tanks and time are primarily designed to earn you more credits to buy new tanks and upgrades for them. The premium tanks aren't as good as the standard tanks in the game; they are only good for earning you more credits. The micro transactions are designed more for the serious players than the casual ones and you can get by pretty easily without spending any money on the game. The great war awaits you. World of Tanks has demonstrated its strength being a compelling online shooter where most have failed in the last 5 years. Its game system, looks, ease of access and time requirements make it an easy favorite to pick up and play at any time. With its developers constantly working on new updates and events for its players World of Tanks will remain a strong multiplayer game in the years to come.